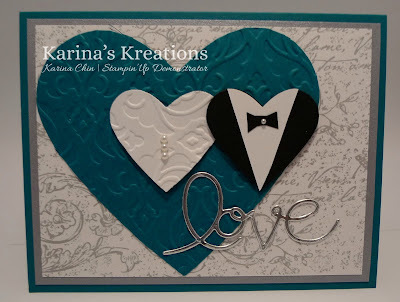 Karina's Kreations: Expressions Thinlits Die! I needed a wedding card and thought Expressions Framelits die would be perfect! I love the "Love" greeting and it looks so pretty in the Silver Foil card stock # 132178. The Very Vintage Wheel and Smoky Slate ink makes a perfect background on Whisper White card stock. The white card stock was attached to Brushed Silver Card Stock #100712 and Island Indigo card stock. The Hearts Collection Framelits #125599 were used to make all the hearts. The Island Indigo heart and the Whisper White heart were embossed with the Beautifully Baroque Embossing Folder #130917. I hope you like my wedding card! P.S. Remember to check out my Late Night Stampers blog post and get my clue!! !